Vibes' new location isn't particularly good looking. More often than not, when I purchase an album, there's always a story that goes along with it. I can remember when I bought it, where I bought it, and why I bought it. These days, with the digital file age, I can't make the same connection or form any sort of memory that makes the listening more enjoyable. The album that prompted this post is Acid Bath's Paegan Terrorism Tactics. I will admit the record never sunk in with me aside from a few tracks, but I can remember all the specifics of where, when, and why I bought it. It's interesting because those events are irrelevant and typically unimportant for the listening experience, but I like the record even more because of those details. It does seem like it was just yesterday when I pulled that record off the rack at Vibes Music. If you ever visited the store in the past, you might known that they decided to relocate, sadly losing appeal in the process. It effectively became what I would describe as a "hipster-oriented" record store. Of course, it still stocked many of the same genres of music, but it lost its welcoming attitude that made one want to browse music of hours on end. It doesn't help that the new location looks trashy, while being situated in an odd area, either. I bought Paegan Terrorism Tactics at the Vibes' old location right before they closed for their supposed upgrade. It was a sunny day, and a good day to drive; the store was particularly inviting beacuse it was having a sale to clear out inventory. I walked out with two albums: the Acid Bath record previously mentioned and Silver Mountain's Shakin' Brains. And, to this day, how I remember such things is beyond me. 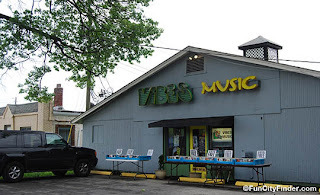 I will say that whenever I spin these albums, I remember how much fun I always had with my dad at Vibes' original location and the hours we spent looking at music. A portion of my collection was purchased there and, without it, there wouldn't have been a halfway decent record store in my area. But all good things must come to an end, and I'm left with nothing worth visiting locally. As I've said before, thank god for the Internet. So, take a second, browse through your music collection, and think back to where, why, and when you bought them. I'm sure you'll be able to dig up a memory on the ones you didn't ever think you'd remember. I have memories like the ones above and memories of hopping from record store to record with friends. All of these can be prompted by simply glancing at an album cover. Weird, isn't it?